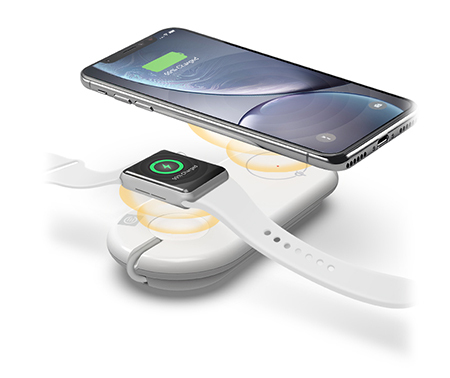 The Wireless Duet Charging Station lets you charge an iPhone and an Apple Watch wirelessly at the same time. The Charging Station has a Qi certified inbuilt wireless charger on one side to charge a wireless enabled phone such as iPhone Xs, Xs Max, Xr, X, 8, 8 Plus or newer models. It also has an USB port to connect your existing Apple Watch charging cable and a socket on the top to perfectly place the magnetic charging connector. Once connected the Duet Charging Station enables the magnetic technology of the Apple Watch charging cable. When the Apple Watch is placed on the charging cable the magnet on the watch aligns itself to automatically start wireless charging. The Duet Charging Station is especially designed for your Apple iPhone and Apple Watch. 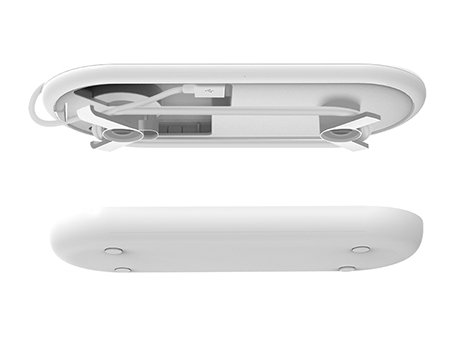 The Wireless Charger is optimised for iPhones with power output of 7.5W. The socket for Apple Watch charging cable is designed for the original Apple charging cable to sit perfectly next to the iPhone. The Charging Station is Qi certified to meet and exceed all the industry standards. This ensures that your devices are always safe and charge at the most optimum speed for best performance. The magnetic cover at the bottom has self-aligning magnets for easy removal when required to install the Apple Watch charging cable. With the ingenious cable management system, the cable is contained neatly under the charger and cover the by magnetic cover. The Charging Station is powered by a single universal USB-C cable. A single cable powers both the wireless charger for the iPhone and the Apple Watch.